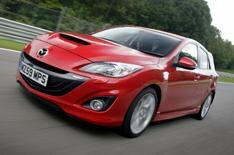 Hot Mazda 3 MPS revealed | What Car? The hot 256bhp 2.3-litre Mazda 3 MPS will go on sale at the beginning of October. The new car shares the same revisions that Mazda has applied across the entire Mazda 3 range. The company says the updated aerodynamics give better high-speed stability, while the new steering and suspension will make the car better to drive than the previous version. Revised gearing and a reduction in the car's weight have helped to cut CO2 emissions by 3g/km, allowing the MPS to meet Euro 5 emissions standards. Despite the changes, there is no loss of performance, with 0-62mph in 6.1 seconds and a limited maximum speed of 155mph. Safety features include stability control, alongside emergency stop signalling, which automatically activates the hazard-warning lights at motorway speeds when the anti-lock brake sensors detect emergency braking. Electronic brake-force distribution and emergency brake assist systems are included. The 3 MPS also gets the rear vehicle monitoring system from the Mazda 6 family car, which warns the driver of vehicles approaching from behind. In the UK, the car will be sold as a single model, including metallic paint and a unique look that features a bonnet air scoop, special front and rear wings, as well as a new grille, new bumpers and deeper sills. Inside, the MPS gets Bluetooth, a 10-speaker Bose stereo and part-leather sports front seats. There are also unique MPS graphics, plus dual-zone climate control, sat-nav and keyless entry with push-button engine start. The high equipment levels mean that there are virtually no options. The only choice you have is exterior colour and there are only four of those: silver, black, red or white. The 3 MPS will cost 21,500.